The MIL-PLG SeriesTM is a military ruggedized redundant N+1 pluggable. 1U 500 to 3000 watts rugged power supply. 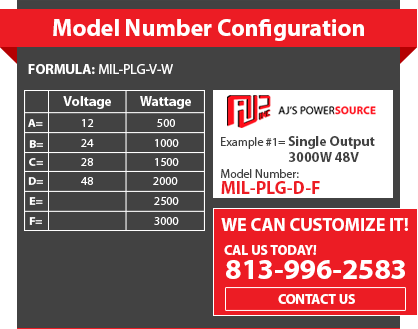 AJ’s Power Source Inc. is pleased to announce the release of our new MIL-PLG SeriesTM. This new power supply has just been added into the MIL-Series Product Line and is a Ruggedized Military compliant pluggable power supply system built for deployment and operations equipment. These units are available to all military, homeland security and government contractors. They are built for a Very Low EMI signature and very High Reliability. This ruggedized power supply system will keep your product up and running for many years to come. The MIL-PLG SeriesTM is a 1U rack mount, single output voltage, rugged pluggable power supply system that provides up to 1500 Watts N+1 or 3000 Watts non-redundant. Each plug in module has hot swap capability and is field replaceable. It comes with N+1 redundant power or standard multiple outputs. The Military Rugged Redundant N+1 Pluggable Power Supply Has Unique Features Designed to Meet All the Military Standards. Single or Three Phase Options. This system has many unique Features such as over voltage, over current, over temperature and short circuit protection. It has remote monitoring and remote control embedded into each power supply system. Stainless steel slide rails allow for multiple rack depths. AJPS’s has been supplying high end Military Redundant Power solutions to the Navy, Air Force, Army, Marines, Special Forces and Coast Guard for over 20 years. All of AJPS’s operations are monitored and controlled by an ISO 9001:2000 based quality systems. To learn more about our custom capabilities please, Contact us online or call our main office at (813) 996-2583 our experienced Representatives will provide you a custom Quote for your custom pluggable power requirements. Input Voltage: VAC – 85-264, 47-63Hz. Operating Temperature : 0 to 50ºC Standard or –20 to 60ºC Available. Storage Temperature: -20 to 70ºC all Modules. OVP: <150% of Rated Output.